Internet sales continue to surge. The National Retail Federation predicts sales will nearly triple by the end of 2017 in the year-over-year growth rate. How can businesses make the most of their digital shelf to boost their own sales? What steps can be taken to improve merchandising and support sales enablement? Companies need to recognize the importance of digital marketing in today’s world. A business can no longer afford to ignore the internet and its worldwide base of customers. One thing to remember when marketing online, however, is the business only has two minutes to catch the eye of the consumer. To do so, add videos to products to show how they work in everyday life and use at least three images per product to allow the consumer to get a better understanding of the product and its benefits. 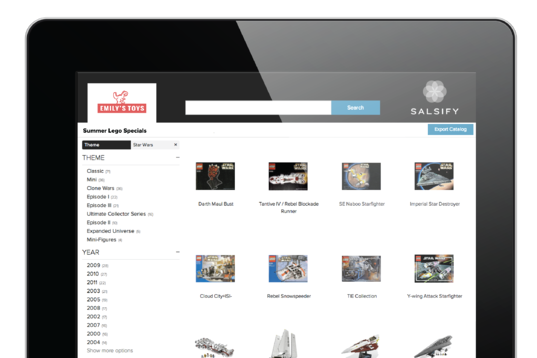 Digital catalogs allow the merchandise offerings to be customized to the customer. Furthermore, product information can be updated regularly to provide better information to the consumer. As a result, customers will be more satisfied, more likely to make a purchase, more likely to return for future purchases and more prepared to share information about the company with others. What Is A Digital Shelf? The digital shelf is nothing more than the online setting where a company displays their products. This may come in the form of any digital channel, if the customer can view products and purchase them via the channel. With the help of an endless aisle, the customer can view the entire lineup of products offered by a company via digital shelves. Product content is of great importance when a company sells products or services online. This information may include a list of the product’s ingredients, a description of the product’s appearance, the story of the brand or any information the company feels may be of benefit to the consumer as he or she makes a purchasing decision. A product content management system will be of great help in this area. Time is of the essence when dealing with consumers. They want information rapidly, and this can be a challenging for many businesses. When a company offers thousands of products to consumers, remembering the details about a product is difficult, if not impossible. With a digital catalog, the sales staff can easily obtain this information and share it with the customer in a timely manner. The gathering of data is streamlined and everybody benefits. Having a digital catalog on hand at a trade show allows a company to showcase their entire lineup of products when a question is asked. Everything is right at the employee’s fingertips when this is the case. Furthermore, information can be shared electronically with individuals who want to know more, but either don’t have the time to learn about the product at the trade show or wish to have it to peruse later at their leisure. Gift guides have been around for some time now. Children loved to get the mail to see if the latest wish book had come from their favorite retailer 40 or 50 years ago, and this tradition continues today. Although the powerhouses of the past no longer put out wish books, many retailers elect to share their product offerings with consumers using this channel. The visual content helps to drive sales, as one survey of retailers discovered that sending out an email with a gift guide helped to increase the transaction rate by 48 percent over other promotional mailings. Gift guides can also be sent at any time, not just in December, thus retailers can take advantage of this marketing opportunity at any time of the year and reap the benefits. Many businesses now make use of multiple outlets to sell their products. These outlets need to be consistent to increase sales. However, each outlet tends to have its own requirements regarding product descriptions, thus a program will be needed to handle the data sets and customize them for this purpose. When this type of program is used, customers receive the information in a shorter period, and this benefits all parties involved. With the help of digital catalogs and catalog management services, companies find they better meet the needs of consumers. When they do so, sales improve. Every company needs to consider this option and determine if it fits into the overall marketing plan. Most organizations will find it does so in every way.